Resumes—no one picks up a handful up at the end of a long day and reads them for pleasure. And for that reason alone, most people look at me with confusion when I tell them that this one piece of paper needs to tell a compelling story. But unlike the stories you may be drawn to at the end of that long day, this one doesn’t get the easy out by working in star-crossed lovers or a murder mystery. Rather, it needs to make its case—the case to hiring managers that you’re the best possible hire—with bullet points and action verbs. Here’s how to realistically make that happen. The quickest way to set the tone is to start off with something that’s immediately relevant to the job you’re applying to. Occasionally, your most recent experience will fit the bill, but in many cases you’ll need to pull some career highlights out into a summary section. Or maybe you’re a little too early in your career to have a list of “highlights.” You can still use this idea, but instead place your skills section at the top of your resume to make sure readers keep them in mind as they look at the rest of your experience. Especially if you have a winding career path, the next step is to give your experience some structure that’s easy to understand. Say you’ve been working a string of part-time graphic design gigs as you try to transition to the field from a sales background. The standard chronological format of an experience section might make you look a little flighty or unfocused. However, if you break up your work experience into two sections—“Design Experience” and “Sales Experience”—then suddenly everything makes sense. Don’t be afraid to break away from the standard format if doing it another way will help you illustrate your story better. Finally, have a closer look at your past roles that aren’t completely relevant to the position you’re seeking now. Have the first bullet point cover the main gist of the role, then tweak the rest to better illustrate transferable skills. (If you’re not sure how to do that this formula makes it easier. Remember, you want to tailor your entire resume—even the bits that are only there to avoid gaps. For example, if your first position was in marketing, but it’s no longer very relevant now that you’re a project manager, it’s still beneficial to point out general teamwork skills you acquired in your early role. Focusing the bulk of your bullets on how you “collaborated across departments” or “presented to clients” will even help explain the transition. Ideally, no part of your resume is just filler. 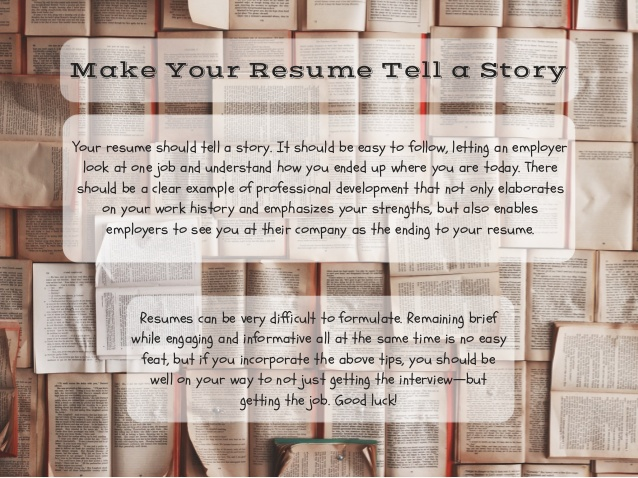 At the end of this process, you should have a resume that not only spells out what your skills and experiences are but also is intriguing enough that the reader can’t help but reach out to you to find out more.